Dr Pepper and how it changed my life. This is my husband, Ed's story. I'm envious because I can't track anything in my life this way. At 15, Ed wanted to buy a car and fix it to drive when he was 16. But he had no money, he made a little bit working at the turkey farm part time. One day a high school senior stopped by and mention he worked at Dr Pepper and was quitting. He was pretty sure Ed could get the job if he went in with him the next day. Ed went and was hired. And from that seemingly small decision to take the job at Dr Pepper he can connect all but two of his oldest friends to the soda company and eventually me. Working at Dr Pepper forced him to make new friends--ones that lived in Belleville instead of of O'fallon. The friends he made there encouraged him to make even more friends beyond the city limits of his home town. Terry was the first friend, who introduced him to Mike who became Ed's best friend. They introduced him to Jerry, which led to Ed going to college and joining a fraternity. Then Jerry introduced Ed to Debbi-who later became became his wife. Debbi was my cousin. She later died as did my husband, both from different kinds of cancer. Ed and I started dating, then we married and combined our families. All because Ed worked at Dr Pepper and married Debbi my life changed! Because we married, Ed went back to church where he has made a lot more new friends. Isn't it fun how one decision driven by necessity can be used by God? Through that one moment of saying yes to the factory job all things in Ed's life--wife, family church friends and 17 cases of Dr Pepper in the garage can be linked. By the way my favorite drink just happens to be Diet Dr Pepper and no I didn't leave the period off the Dr because there isn't one! Find more a2z posts at Patty Wysong. I never knew that! Wow! It's pretty cool when you can look back and see how God has been stringing together the bits of your life. Not anything you could have ever set out to plan to do. Very cool! The entire story is fascinating. I didn't write it all out, but he can connect so many people to that one event. Totally fascinating stuff. Love that you can trace that. FUN. God is awesome and always in the details! Love how you connected the dots! Sounds like there's a book in there somewhere--waiting to be written. Hugs! So true! And that is precisely why regret is a senseless thing. We all have sadness and remorse. But to regret the life that gives you so many gifts is really just silly. Great post! It really is amazing and wonderful to look back and see God's hand in our lives. What fun! 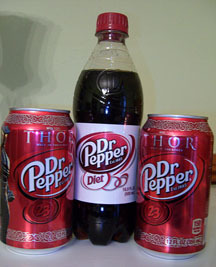 Another great reason to love Dr. Pepper! Nice post. That is such an awesome story! It reminds me of those "choose your own adventure" stories. Nice to meet another Diet Dr. Pepper fan. I wish they would bring back the Diet Cherry Chocolate flavor. They had diet cherry chocolate? I must have missed that one. We should write the company and ask for them to bring it back. It sounds yummy. Now I have to say that this D post has been the most original I've read so far tonight:) Pretty awesome! What a great example of God's leading in our lives and realizing that none of our life-changing events could ever by orchestrated by our own attempts. Such an uplifting story.